For big jobs you just can't beat the Kargo Master Pro II Van Rack. Constructed from heavy-duty .083" thick steel with 2" thick round tubing, these van racks feature a superior design that allows them to carry up to 1,000 pounds of cargo. These heavy duty racks feature round steel tubing that's more aerodynamic than square tubing cargo racks. 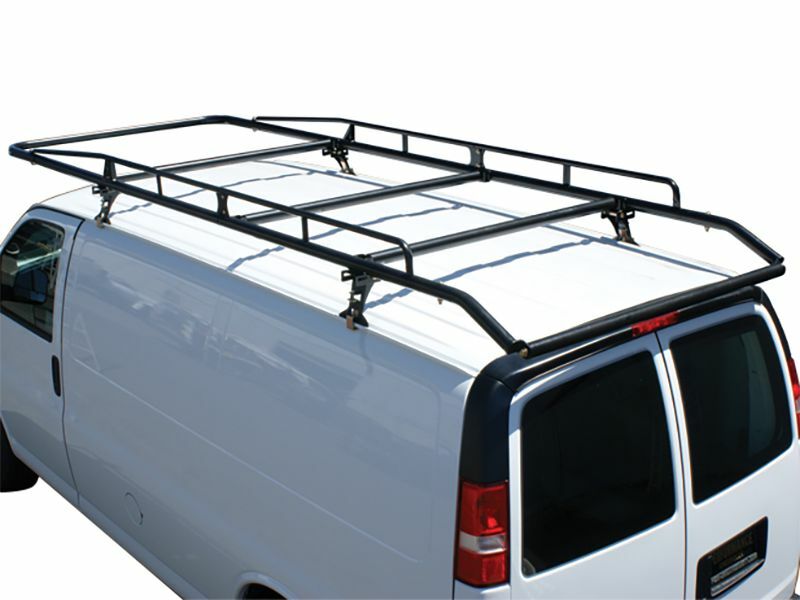 The Pro II Van Rack fits both standard and extended box vans. The heavy-duty mounts clamp securely to your van's rain gutter system, and the wide mount feet are coated underneath to help protect your van's paint. All racks include four, level cross bars to help distribute even the most awkward loads. The rear roller crossbar is angled to assist with easy loading of heavy or bulk cargo, the 165" long by 55" wide size will help you maximize cargo capacity. All Kargo Master racks are treated with a zinc primer that seals the metal before being finished with a marine grade powder coat finish that will not fade or dull, and is highly scratch resistant. Kargo Master uses yellow zinc dichromate fasteners that outlast standard white zinc fasteners 5 times longer. This rack is a no-drill installation and comes with self-locking nuts to ensure the install stays tight all year long. All Pro II van ladder racks are backed by a lifetime warranty. This product offers an easy, at home installation. The installation manual is clear cut and easy to read. For additional information, please see the installation manual below. You may also call us toll free at 1-877-216-5446 or 701-253-5906.